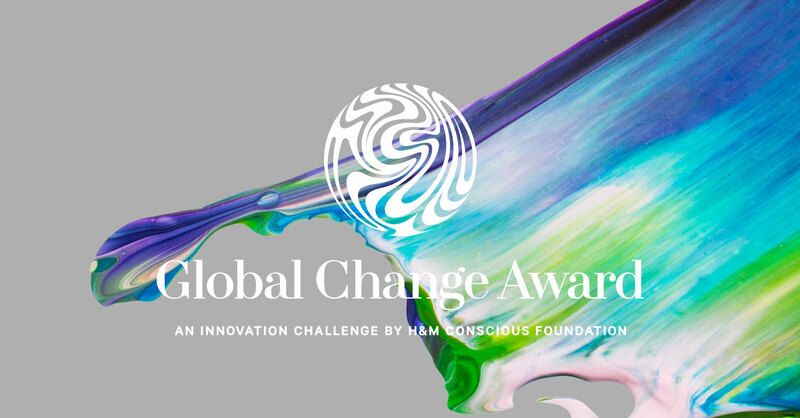 We have won Global Change Award by H&M Foundation! We are pleased to share with you a great news: with our sustainable textile from citrus juice by products we are one of the five winners of Global Change Award, the innovation challenge initiated by the non-profit H&M Foundation in August 2015 to select bold ideas that can help to protect the earth’s natural resources and close the loop for fashion! Our 1oo percent citrus textile has been selected by an international expert jury among more than 2,700 innovators from 112 different countries and, obtaining 15% of votes by the on line popular jury, it ranked 4th winning a grant of € 150.000 (on a total grant of EUR 1 million) and one year innovation accelerator provided by H&M Foundation in collaboration with Accenture and KTH Royal Institute of Technology in Stockholm to develop the project. The innovation accelerator will also provide exclusive fashion industry access and offer possibilities to build networks and try out the ideas within the fashion value chain. HRH Crown Princess Victoria of Sweden awarded us during the Grand Award Ceremony in the famous Golden Hall in Stockholm City Hall – the venue of the Nobel Prize banquet held on 10th of December each year. The victory at Global Change Award is a great opportunity for us. Thanks to the grant and the one-year tailor made acceleration program we will be able to test, improve and scale our business idea. It will also help us improve our process according to circular economy principles. The Global Change Award was introduced in August 2015 by the non-profit H&M Foundation. Between 25 August and 31 October the challenge was open for anyone to apply. Over 2,700 innovators from 112 countries contributed. The H&M Foundation reviewed the applications with the help of innovation collaborators KTH Royal Institute of Technology, Accenture and the Expert jury. The five ideas considered to have most potential in helping close the loop for fashion was selected as winners. A total of 22,500 online votes were placed to split the €1 million grant between the five winners. Most votes came from Germany, U.S, The Netherlands, Sweden, Italy, Russia, France, China, U.K and Finland. Starting off, KTH Innovation invites the winning teams to a one week intensive immersion program at KTH campus in Stockholm. This will be followed by a one year training and coaching program, provided by Accenture Strategy. The winners will get individual coaching and tailored learning sessions and assignments in order to take their ideas to the next level. Through the H&M Foundation and H&M, the Innovation Accelerator will also provide exclusive fashion industry access and offer possibilities to build networks and try out the ideas within the fashion value chain. The H&M Foundation is an independent non-profit global foundation, initiated by H&M. The mission of the Foundation is to drive long lasting positive change and improve living conditions by investing in people, communities and innovative ideas. Today, the Foundation is funded by the Stefan Persson family – founders and main owners of the Swedish fashion company H&M. Since 2013, the family has donated SEK 900 million to the H&M Foundation. Dr. Michael Braungart: Academic Chair “Cradle to Cradle for Innovation and Quality” at Erasmus University Rotterdam; Professor at Leuphana University Lüneburg; Scientific Director of EPEA Hamburg. Prof. Rebecca Earley: Professor in Sustainable Textile and Fashion Design at University of the Arts London and Director of its Textile Futures Research Centre. Mr. Ma Jun: Director, Institute of Public and Environmental Affairs, China. Ms. Eva Kruse: CEO, Danish Fashion Institute; CEO, Copenhagen Fashion Week. Prof. Johan Rockström: Director of the Stockholm Resilience Centre and Professor in Environmental Science with emphasis on water resources and global sustainability at Stockholm University. Mr. Ellis Rubinstein: President and CEO, The New York Academy of Sciences. Ms. Franca Sozzani: Editor in Chief of Vogue Italia. Ms. Amber Valletta: Supermodel, actress & entrepreneur.